They must use a strictly glass jar. Blenders with tritan copolyester (sold as BPA-free) are still not acceptable for this category. Glass only! Considering its average rank of 83%, we determined that the BESTEK BL15 is currently Alphachooser's best glass blender 2019. We also believe that our 286 reviews sampled from our sources give us a high confidence level (more on confidence levels) that allows us to call it a "no-brainer best choice." Jar capacity: 20.5 (pitcher's capacity) oz. 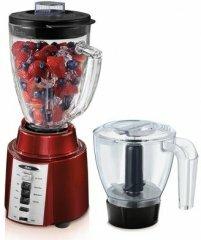 With its star rating of 4 over 57 reviews, we rank this Hamilton Beach model second best glass blender. * Btw, our choices are based on an in-depth analysis of hundreds of glass blender reviews from multiple sources. The Oster Pre-Programmed BVCB07-Z00-NP0 is an unconventional 6-cup blender with a reversing-blade feature, a six-point stainless-steel blade, and an LED-backlit control panel. The Oster Pre-Programmed BRLY07-B00-NP0 is a squared-base 6-cup blender with a reverse-rotation function, seven speed settings, and a six-point stainless-steel blade. 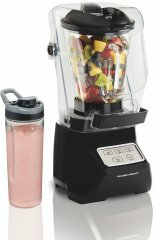 The Hamilton Beach Wave Crusher 54221 is an average 40-ounce blender with a Wave Action system, fourteen speed settings, and three years of warranty. 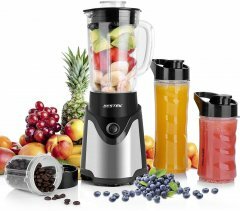 The Oster 6811 12-Speed is a variation of Oster's classic blender with 12 preset programs, including shred and cream as well as liquefy and ice crush. 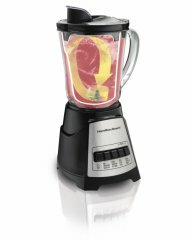 The Oster 10-Speed is an inexpensive blender with 10 speeds, each labelled with a specific program, including ice-crushing and grinding. Jar capacity: 24 (It also comes with a 16oz and an 8oz tempered glass containers) oz. 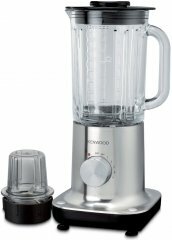 The Hamilton Beach Chopper 58149 is a blender set that can also be used for chopping with its separate chopping jar, with four pre-programmed settings and two pulse speeds. 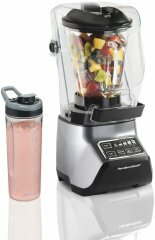 The Hamilton Beach Smoothie Smart 56206 is a small 40-ounce blender with a 45-second smoothie program, a Wave Action system, and a patented spill-proof pouring lid. 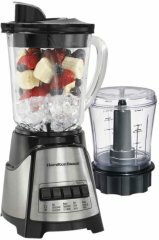 The Hamilton Beach Power Elite 58148 is a mid-ranged 40-ounce blender with an Ice-sabre blade, a Wave-Action System, and a three-year warranty. The Oster BCCG08-RFP-NP9 8-Speed is a versatile six-cup blender that comes with an additional three-cup jar for food processing. 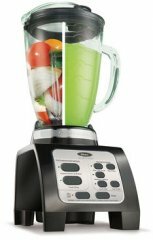 The Oster Pre-programmed BLSTDG-B00-NP0 is a moderately-featured 7-cup blender with a 45-second frozen-drink program, a 450-watt All-Metal motor drive, and a vented-plastic lid. 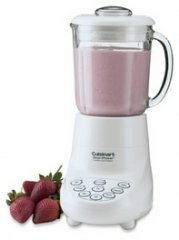 The Cuisinart SPB-7 Smart Power is a UL-listed 40-ounce blender with seven speeds, an Italian-inspired design, and a three-year warranty.